The Verge recently spoke with Series Director Tetsuya Nomura about his work with the Kingdom Hearts series over the past 16 years and the long-awaited Kingdom Hearts 3. This series has the reputation of having a very convoluted story that even the most dedicated fans may have difficulty wrapping their heads around. Although he is expected, as the creator, to understand each and every little piece of detail, even he has difficulty following it all. And while he had once felt very close with and related to Sora, even viewing him as a son, that relationship has since changed dramatically. Of course, being the creator of such a notable franchise isn't all sunshines and rainbows. All that excitement from fans leads to high expectations, which puts a lot of pressure on him to deliver a good product. Read the full interview on The Verge. So Nomura identifies more with his villains than the protagonist? I wonder why he didn't just write Sora more as a reflection of himself? Maybe thatâ€™s what Vanitas is? He used to feel that way, he just doesnâ€™t anymore. How hilarious to hear that even Nomura himself has difficulty keeping track of his own story. However, as someone who has attempted to write a large overarching plot myself, I actually completely understand this. It's why some authors create large "plot documents" so that they don't have to worry about forgetting smaller details in the massive web of plot threads they've created. Creating in-depth lore, especially in the fantasy genre, can get very complicated and difficult to keep track of very quickly if its not grounded in a realistic framework. Game of Thrones, for example, is mostly grounded in realistic human interaction, which is why it's not very difficult to keep track of everything. JRPGs are the polar opposite, where the zaniest of ideas are passed off as totally normal. It's very good to hear that Nomura was able to shake the feeling of pressure and is confident in KH3. That gives me all the more hope for the game. It sounds like Nomura is very happy with how it's turning out despite the difficulty of dealing with a resolution to such a big plot. It's very obvious that he's still depressed after his rejection on FFXV. He seems quite lost. If she's going to be easily norted by The New Orginazition 13? Nomura's main goal in writing has always been shock value. He believes that a story should be surprising above all else. Aquanort and the return of Riku Replica are classic examples of Nomura doing his same old shocking scenes. Besides, Nomura has already stated that saving Aqua will "depend on the player's actions" so he's already hinting that she can be saved, meaning she probably will be. If I recall correctly from earlier interviews Nomura did indeed once state Sora's like a son to him, but he also stated that Sora is the "good kid" he himself never was and in terms of personality they're really not that much alike to begin with. I do wonder though if this shift of views more towards the villains does have something to do with the whole getting shafted from FF XV issue. I also have to agree with Nazo on the writing parts. This need of Nomura to make everything "surprising" and get out as much shocking stuff as possible is a significant flaw in his scenario writing as by prioritizing it over everything else leads to him sometimes screwing over the lore and background work he himself established. But maybe at least partially destroying/contradicting his own established "universe" is right now part of his overall mood. Reminds me somewhat of Hideaki Anno and Neon Genesis Evangelion where a similar situation was at hand. Well, I would have to disagree on Aqua's change being loose writing. We have no idea what has happened to Aqua (and Ansem the Wise for that matter) at the time they meet during/after KH2. Aqua being converted to the dark side isn't a contradiction to her conviction to helping others pulled into the Realm of Darkness. Especially, when we have no idea how "easily" that happened. Now, definitely that Famitsu interview years ago where he said Nobodies don't age is a bit of loose writing, as clearly shown in the game, they do. Can't really get around that mistake there. The problem with creators I find mostly, is that they don't include information or explain things that are needed within the context of the game itself. A lot of questions or speculations are approached in interviews, when really, all things that should be explained or revealed about the lore or certain concepts should be in the story itself. Yikes, someone give this guy a hug. The comments about Sora make me a bit sad. The problem with creators I find mostly, is that they don't include information or explain things that are needed within the context of the game itself. A lot of questions or speculations are approached in interviews, when really, all things that should be explained or revealed about the lore or certain concepts should be in the story itself. This sums up exactly what I was thinking of. There's a solid chance that he's just being funny in his own strange way. Maybe? I kinda hope cuz Xehanort isn't likable or relatable at all. He's a very cookie cutter cartoon villain, so if he truly relates to him that is concerning lol. I must agree with everyone else he comes off like he might have some issues to work through still and I just hope he doesn't let it all get to him lol. I'm glad Nomura is being vocal about this. It's always interesting to see where the creators minds are at during development. There's no doubt the pressure cooker of expectations has made past decade hard on him. I see an inevitable hiatus to decompress in his future. This makes me sad, it sounds like he's been a kinda depressed. When he says he relates more to the villains or anyone who's fallen to the darkness, I feel like he's talking about Terra. Terra has basically become Xehanort now. He's warrior of the light who's fallen so far into the shadows, and that seems like a poetic symbol for depression. People here are overreacting. All this "Nomura is depressed" stuff is making me roll my eyes. He simply just doesn't relate to Sora. Nothing wrong with that. Sora is the definition of bland, nice and sunshines. As crazy as Xehanort's ideals and logic might seem, they have a sense of realism to it that Nomura relates to. You don't always have to relate to the heroes. That would be boring so I can understand where Nomura is coming from because I don't relate to Sora at all either. I mean, it's well known that he was deeply upset by being removed from FFXV, but what he said is more humorous than what people are taking as a cry for help. Try reading his quote again. He's not confused by the story as a whole; he has difficulty keeping track of all the minor details that would impact a character or event at any given moment. I mean, I picked up the humor too. There's truth in jest though, and it's not as though he's trying to make us slap our knees here. One can easily see how difficult it's been given the circumstances. You still just kindof have to sympathize with someone whose 180'd into Xehanort mode. "Haha.. aw." Nomura has already stated that saving Aqua will "depend on the player's actions" so he's already hinting that she can be saved, meaning she probably will be. I mean, you can be depressed and still be humorous about it (source: me) but I'm not about to argue on the emotional state of a person who can speak for themselves. I do think the man is exhausted, though. It is hands down the biggest flaw in the scenario writing of the franchise. It's fine to have plot twists and shocking moments, but Nomura seems to think that a story isn't complete or exciting if there's not some grand revelation or surprising moment. The problem is, shock and surprise have to be earned to have a genuine impact, otherwise it just breeds confusion. And given how KH is notorious for its confusing storyline, you can see how Nomura's emphasis on surprise over consistency has had its impact on the story of the series. So, no one here remembers that Nomura has stated the same about relating to the villains thing, like, a year ago? Stop dramatizing, especially because in some other interview he said he is hyped for the future of the series even more than KH3. Xehanort confirmed for Creator's Pet. Truth, his statements have been blown out of proportions and I'm not talking solely about KHI. Sadly, this is just when he calls the other titles "spin-offs": he's talking lightly and doesn't mean anything serious or dismissive, but fans platforms all over the Web are ready to take his quotes and make "Nomura doesn't understand KH either!!!!!" articles. He's just saying he sometimes has difficulties in keeping track of a wide roster of characters in a story with a 16 years lifespan, that's pretty normal and should be to anyone who tried making a long story at least once. It happens to D&D Masters with their own campaign, even. I stand by my point that KH is way less complicated and more predictable than people make it out to be. Which is a statement that recently got on Twitter in response to people making excessive fun of it after the E3 trailers, and I was so happy to see it. From the sound of it, originally he did. I'm sure with Square constantly putting pressure on him, he eventually "succumbed to darkness" himself, and eventually grew more empathetic to his villains. Sora is probably really what he once was. So true, no doubt he's basically writing about his depression. I've never been fond of his shock value moments and never will, they basically just make his decisions seem more untrustworthy... and it takes away one's feelings towards a character if they're just used to shock people. For me, it's less about my feelings towards a character and moreso the fact that prioritizing shock and awe over consistency and coherency is what has caused the plot to spiral into convolution. When Nomura comes to a fork in the road in this plot and one road is called "Following Preestablished Rules to Reach a Coherent Outcome, but It's Not Super Exciting" and the other is "CRAZY Plot Twist, but It Kinda Doesn't Make Sense" Nomura takes the second route every time. And while I don't blame him for loving his "big reveals" and shocking moments, he tends to write them in solely for the sake of getting a rise out of the fanbase rather than trying to write a well-crafted and consistent plot. And sometimes it feels like some of these "shocking" scenes were made solely to make the trailers themselves more interesting, when in actuality it turns out there isn't that much to it within the game itself, such as the scenes of Vanitas and the other Riku's two second appearance in DDD. So I kinda worry things like Aquanort and the new seven hearts will wind up not being all that much either. A recent example of "trailer shots" that doesn't have to do with plot twisting but it amused me: Ansem and Xemnas dramatically leaving with a simultaneous 'Now...set your heart free." Which actually looks kinda silly and just makes me think they practice this stuff offscreen. Obviously I didn't make myself clear. I really don't care about if he's relating to a certain character, that's not what I was referring to. I'm referring to the fact that he's implanting lots of references and not to mention creative decisions into this game from FF. I don't spend my time on agreeing on something I feel the opposite. I just won't believe that Nomura seems to know what his doing with this game, obviously he has a vision for how it's going to be ... but the game seems like it's heading down the DDD route so far. By adding unnecessary elements that just keeps creating new plot holes, is just not a good sign if you're never going to adress the missing pieces for the story to click. The whole Aqua debate, I don't give much thought anymore. It could turn out either way and I'll just wait to see what it will lead to. I will however stand for that I find this whole story arc ever since DDD to be confusing and just a big mess with lots of ideas thrown in. The thing that makes me worry this might be the case (aside from the man's previous mistakes) is that Nomura was surprised people reacted in such a way towards Aqua and didn't instead notice the introduction of a movie that was so obviously going to be in KH III it was even scribbled on the margin of a paper during the writing of that movie's script. Like, perhaps he believed people would recognize this stuff was only there to tease? I hope not. Sora is the definition of bland, nice and sunshines. 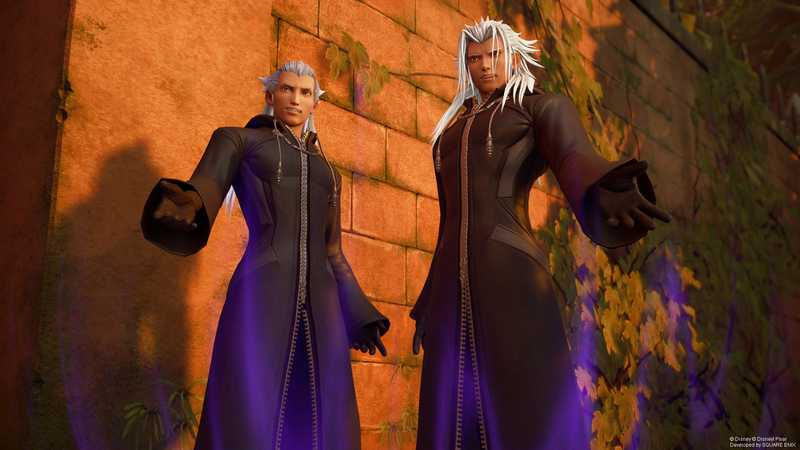 Xehanort is the definition of confusion, futility, and tedium. As crazy as Xehanort's ideals and logic might seem, they have a sense of realism to it that Nomura relates to. As realistic as an Aizen 2.0 whom the space-time continuum keeps bending over backwards for, can be. I'm afraid I don't quite get the hostile tone here... what is your point? That Nomura is actually depressed, or that he's crazy for relating to such a character in some shape or form? I hoped the creator expressing some sort of empathy with the villains would've make people be less jumpy on mentioning positives about them. There is no "hostile tone" (and I apologize if it comes across as that). I'm just expressing the opposite end of the spectrum according to KeyToDestiny's points. Obviously Nomura is the Master of Masters. How hilarious to hear that even Nomura himself has difficulty keeping track of his own story. parallel worlds, time travel; that all intertwines between multiple games. I remember Nomura saying that both Sora and Noctis were like sons to him. Kingdom Hearts was his own personal iteration that turned into one of Square's biggest and profitable IPs that now people put besides FinalFantasy and Dragon Quest, thus creating Square's "Trinity". While Noctis was part of his own personal, and very ambitious, Versus XIII project, which he had also envisioned to turn into a trilogy. I think what hit Nomura the hardest with the Versus XIII project was that I think that particular video game was when he hit his peak as a director. I remember Nomura overflowing with a hell of a lot of ideas back then about the game, and even making a musical after watching Les Miserables. I think Nomura is an artist in the sense that he gets easily influenced by other ideas, and he wants to execute them in his own way and see the results of his work. And while he got shafted from the Versus project, we have to remember that Versus was originally a sort of spinoff-ish Final Fantasy title that was to be branded under the Fabula Nova Crystalis project way back when. Then it was given to another director, and was rebranded as a mainline FF title. It's practically a godgiven that Nomura was put into the FF7 Remake project for the sake of compensating the management's incompetence towards their handling of Versus. And besides being character designer for the original FF7, I believe he also contributed small pieces to FF7's scenario writing. Given Nomura's artistic nature, even though some people hate that he's the director of the remake project, I think he's the most fitting to direct it, seeing as how the man literally created another IP for SE, and the man deliver quality titles in terms of performance. Like seriously, Nomura is on Nintendo level of polish. With what Square Enix as a company has in mind with the FF7 project, I think their vision goes along with how Nomura's mind work. But on to the main topic, it's pretty understandable that he's having a hard time keeping up with the lot of characters he has created. Hopefully his process during the Xehanort Saga has taught him to be a better creator for the KH titles to come after this arc is finished. That's cool, I also apologize if that wasn't your intention. I just thought this might be another instances of attacking people if they badmouth Sora or express sympathy for Xehanort. Tbh I feel this is less about him losing FF15 and more just the fact that he might have lost creative control and therefore affinity over Sora and the (lack of) direction of his character. I mean it's obvious powers above him have dictated Sora needs to the happy-go-lucky eternally innocent and overly positive i.e marketable archetype, and who could blame a writer for the resentment of his stolen beloved character that he's not allowed to change as much as he might wish? I don't think you need to be necessarily depressed to have this reaction. Though I know KH3 is leaning towards Sora changing (which is insanely past due at this point), I'm not so sure it means he'll mature or even have good development with a natural depth progression, if the trailers we've seen so far are anything to go by.